This elegant little widget displays a circle showing the current battery level. The colour and size can be modified to suit your tastes. 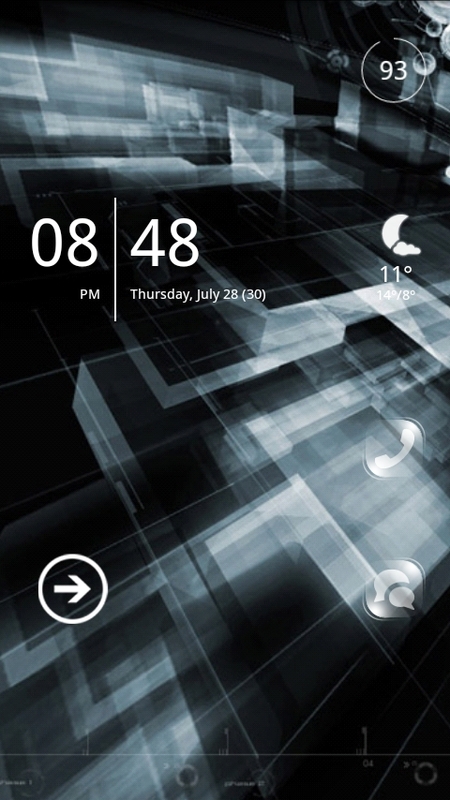 SimiClock displays the current time, date and weather, with each option being customisable. OneSeven displays the days of the week, with the current day highlighted. Displays the current date and time, in a highly customisable format. My Arc came with Sony's Timescape widget. It's basically a flip file of Facebook, Twitter, Messages and Calls. For Twitter and Facebook posts, it puts the accounts profile picture as the background. I'm sure it sounded good on paper, but in reality it means you get a bunch of hard to read posts with heavily pixelated backgrounds. Even my old Sony Aino had a nicer Facebook streaming widget. The Facebook widget shows the latest posts from your newsfeed, with an input bar to update your status. The downside is you cannot customise the layout at all and are stuck with the Facebook blue/white look. Go Launcher Ex FBWidget goes a little further than the official Facebook widget. It shows a list of the latest newsfeed entries, with each entry containing expandable show comments. Similiary to the Facebook widget though, you are stuck with the widgets default white/blue look. It required Go Launcher Ex to run. Similiar in look to the Facebook Widget and also without any customisation options. Colorize is a collection of widgets to display a bunch of things including Facebook, Twitter, Messages, Calendar, and Contacts. The free version allows for a moderate level of customisation via themes, while the Pro version allows for changing individual items within a theme. Also of note is the ability to launch another application of your choice upon selecting an item. This is especially handy if you do not use the official Facebook or Twitter apps and want to launch a 3rd party application.